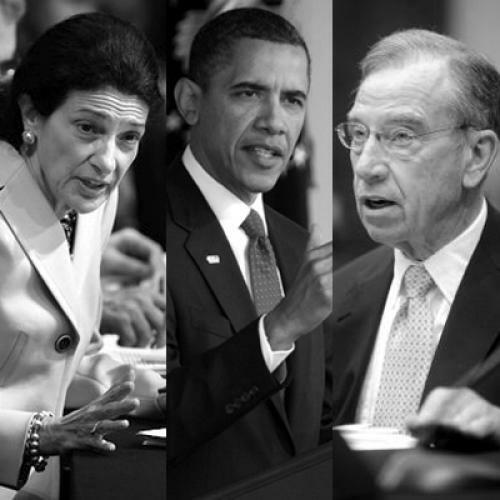 How Obama saved the House bill from near-death and what Olympia Snowe really wanted from Congress. This is the fourth of a five-part series explaining, in remarkable detail, how Obama and the Democrats came to pass health care reform. (Click here to read parts one, two, and three.) Be sure to come back tomorrow for the final installment, which reveals how the White House decided not to drop health care reform in the wake of Scott Brown's victory, and what Nancy Pelosi did to broker the final deal. Barack Obama, the law professor, was acting like a prosecutor. He’d invited Grassley to the Oval Office, to talk about the senator’s concerns. But he was using the occasion to confront Grassley about his latest statements. “Tell me what amendment you want, tell me what language you want,” one administration official recalls the president saying. And then, when Grassley couldn’t point to anything, the official says the president reminded Grassley that the amendment on end-of-life counseling had come from a Republican, Johnny Isakson of Georgia, and simply paid for professional advice when people wanted it. But Obama’s mind was already wandering to the new strategy he’d have to adopt. The first seven months of his presidency had been a test of his belief in civility and bipartisan cooperation. Now, he had the results. They were not encouraging. Perhaps nothing epitomized the unmooring of the debate from reality better than the treatment of Ezekiel Emanuel, a prolific bioethicist and oncologist (and Rahm’s brother) who was advising Orszag at OMB. Right-wingers pulled out some stray quotes, mashed them together with the end-of-life counseling controversy, and decided that Emanuel was “Dr. Death,” intent upon forcing doctor-assisted suicide on the sick. In fact, the highly respected Emanuel had written a famous article for The Atlantic arguing against euthanasia. More respectable conservative intellectuals, like former McCain adviser Gail Wilensky, vouched for Emanuel and decried the distortions. Nobody could hear her above the screams of Fox News pundits. Worse still, the White House seemed powerless to change the conversation. Some administration officials would later blame Congress, because of its glacial pace. “We didn’t actually have a product to sell or defend,” according to one senior official. Some would acknowledge internal disorganization. There was no official media “war room” for most of the summer, while rivalries between policy advisers (particularly DeParle and Orszag) diverted aides’ attention. And that, to Obama, meant becoming a lot more aggressive—starting with a nationally televised address in September, one that would help correct the distortions, remind Americans of the bill’s real contents, and stiffen the spines of nervous Democrats. That last part was important given what many Democrats had heard and seen during the August recess. Conservative activists had flooded town meetings, in a combustible mix of media hype and genuine grassroots energy. The Chamber of Commerce and several insurance companies started pouring money into anti-reform advertising. But, in the wake of Kennedy’s death on August 25, at least some Democrats were also thinking about the party’s historic principles. An even more important development happened before the speech. The administration told reporters that, along with the speech, it would unveil its own proposal, just to make clear what provisions it supported. Quietly, it was doing more than just drawing up a memo; it was writing an entire bill, in legislative language, in case Baucus wouldn’t move. Reid, meanwhile, delivered his own message to Baucus: If you don’t get a bill out of your committee soon, I’ll go around you and simply introduce a bill on the floor. Feeling the pressure, Baucus held the second of two conference calls with the Gang of Six: If he didn’t move now, he explained, Finance might end up out of the picture altogether. Baucus announced he was starting hearings in mid-September—and the White House decided to leave its bill where it was, on a policy wonk’s hard drive. Moving ahead on legislation didn’t mean that legislation would pass, particularly given the debate about dollars. Baucus had been looking at some proposals in the range of $700 to $800 billion—too little, in the opinion of most experts, to pay for providing most people with a decent benefits package. One reason was that he was struggling to come up with money to pay for it. He’d wanted to finance his package by curbing the tax preference for health insurance, which CBO director Doug Elmendorf had said was the surest way to reduce the overall cost of care. But, in early summer, Reid had told Baucus that Senate Democrats would not support such a move. Reid seemed to be conveying a message from the White House—and that had set back progress, since Baucus didn’t have an alternative funding source that he could sell to his committee. In the September speech, Obama sent two key signals about how to solve these problems. His first was to specify a figure for the overall cost of the health care plan. Reform, he said, should cost somewhere in the neighborhood of $900 billion over ten years—enough, by administration and CBO estimates, to cover 30 to 35 million people or something resembling comprehensive reform. Then, Obama endorsed an idea, first floated by Senator John Kerry, to tax insurers for the provision of expensive plans. Economists believed it would have the same effect as curbing the tax break on insurance, but, because the tax ostensibly fell on insurers, it was more palatable politically. Baucus still had other problems—particularly on his left, where two Democrats with legitimate claims on the health care issue, Jay Rockefeller and Ron Wyden, wanted a chance to introduce their ideas. (Rockefeller wanted a more generous package; Wyden wanted amendments to offer workers more choice of insurance.) Then, two days before the vote, the insurance industry released a study purporting to show that reform would hike premiums. The study, from PricewaterhouseCoopers, was full of loaded assumptions—and even Democrats normally friendly to the industry blasted it. “I think what solidified the Democrats was the publication of the AHIP report,” says one senior aide who was involved with the Finance Committee negotiations. “It was the single dumbest move that I think the insurance industry did.” Every Democrat on the committee ended up voting for the bill. So did Olympia Snowe, although she made clear her vote on a final bill remained in doubt. Obama’s announcement, during the September speech, that reform should cost around $900 billion had helped break the Finance Committee logjam. But it also undercut the House, whose coverage expansion provided stronger guarantees against financial risk and, as a result, was well over $1 trillion. During the spring and summer, the House committees had heeded Obama’s instruction to stay fiscally responsible—trimming back their ambitions and raising more money to cover the new outlays. Now, Obama was forcing them to scale back even more. The administration hadn’t even warned the House that the figure was in the speech. Senior Democratic staffers say that Pelosi found out about it the way the rest of her chamber did: On the floor, when the president spoke. She betrayed no anger in public but expressed plenty to the White House in private—and won some room to maneuver when administration officials clarified that $900 billion was the net figure, not gross. Soon, though, it became clear Pelosi wouldn’t get 218 votes without some kind of compromise on abortion. The committee bills called on insurance companies to separate out funds used to pay for abortion services. Opponents of abortion rights, led by the U.S. Conference of Catholic Bishops, said the distinction was meaningless and wanted an outright ban on abortion procedures in the new insurance exchanges. Bart Stupak, a Michigan Democrat and opponent of abortion rights, was leading a group of Democrats who agreed. In the spring, the committee chairs and leadership were more confident they had the votes to pass reform without Stupak’s assent. But reform’s popularity had slipped, and, a day before the vote, Pelosi still didn’t have 218. As the Post’s Ceci Connolly has reported, Pelosi held a series of conferences with the Stupak group and the women of the Democratic caucus. Eventually, she confronted the women with the grim reality: She had to make the deal with Stupak or reform would fail. Pelosi teared up at the meeting, and, that night, Rules Committee Chair Louise Slaughter skipped her own committee hearing rather than be present for the insertion of the Stupak language. With the abortion deal in place, the daylong House debate played out as ritual—with members giving short, canned speeches. Late into the evening, the House passed the reform bill with 220 yes votes, including Republican Ahn “Joseph” Cao, who’d switched to yes after the Stupak compromise. Staff would later say Pelosi had a handful of extra votes in her pocket if she needed them. Over in the Senate, liberals were just as angry—and they focused their efforts on the public option. All year long, the administration had sent mixed signals: Obama would say he supported the idea, but he stopped short of calling it a make-or-break issue. Privately, aides readily conceded the idea had little chance of passing—and many figured that Reid would simply drop the public option on his own, when he blended the Finance and HELP bills. But, in late October, Reid made clear during a White House meeting that he had no such intention. Liberals were already seething over sops to the right Baucus had made; if Reid compounded the problem by eliminating the public plan, they might bolt. According to sources familiar with the conversation, the president merely listened and asked pointed questions. As Jonathan Alter recounts in his new book, The Promise, Obama was skeptical: “Obama was on record favoring a public option, but his first priority was a bill. And he still thought the best way was to win over Snowe.” But Reid said he knew his caucus: His was the best way to 60. Snowe was unhappy—as much with the process as the outcome, according to people familiar with her thinking. Baucus had courted the famously deliberative Maine senator carefully, talking with her for hours about every last item on her long list of concerns. The administration had also blanketed her with attention. Obama hosted her in the Oval Office multiple times. Peter Orszag even had dinner with her while traveling in Maine. But patient, casual conversation is not Reid’s style. He likes to get down to business, and, when he’s through, he moves on quickly. He’s been known to hang up the phone abruptly when he finishes a conversation, without bothering to say goodbye. When Reid prepared to release the merged bill, Snowe felt like she was no longer part of the process. But even those within the administration who had defended the pursuit of Snowe had grown weary of negotiating with her. During the Finance markup, Baucus had addressed nearly every one of her concerns, but he didn’t learn until the day of the vote that she would support the bill. Obama and Reid had gone through her latest list—and were amenable to most of it. But, again, Snowe wouldn’t commit. Had Reid waited, many say, he’d still be waiting now. Instead, Reid focused on the centrists in his own caucus—picking them off one at a time until he got to Joe Lieberman, who had made clear he wouldn’t support a public option. After a maddening back-and-forth in search of a compromise, during which Reid felt double-crossed by Lieberman, Reid finally shelved the public option once and for all—but only after Lieberman promised to vote yes. That left Nelson, with whom negotiations were far more straightforward. Nelson gave Reid a list of “concerns.” Reid, working with the White House, quickly approved several of them, including higher Medicaid payments for Nebraska. No other state would get such treatment, but, Reid figured, that’s how bills get through Congress. After Republicans abandoned a plan to stall during the voting process, Reid called the final vote around 7 a.m., the morning before Christmas. Reid, exhausted from his marathon negotiating sessions, accidentally voted no before voting yes and collapsing into his chair. The ailing Robert Byrd of West Virginia, wheeled in for the occasion, announced he was voting yes “for his friend Ted Kennedy”—while Kennedy’s widow Vicki watched from the gallery. Around Washington, Democrats celebrated—and made plans to cut short long-scheduled vacations, so that they could start the final negotiations between the House and Senate. Rahm Emanuel checked in with the president, assuming he would sign off on that timeline. No, Obama said. Everybody is exhausted and that’s not conducive to negotiation. Wait until after New Year’s. Check back tomorrow for part five, which reveals how the White House decided not to drop health care reform in the wake of Scott Brown's victory, and what Nancy Pelosi did to broker the final deal.